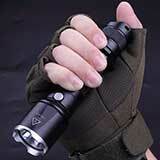 Do you want a compact pocket size tactical led flashlight? Then 900 lumen Fenix PD32 will be a great choice for you. 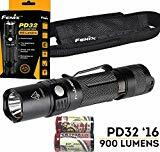 If you need a bright, waterproof, impact resistant, durable, over-heat protection, low voltage warning features flashlight, then buy this PD32. The 5 brightness levels and dual switch option make it easy to use. The Fenix PD32 flashlight is not only light our paths, but as well can be used as defensive weapons through blinding or hitting an attacker. Read this Fenix PD32 review to know more about this light. 4 Why choose the Fenix PD32 900 Lumen light? In this fenix pd32 review, we want to look at the Fenix PD32 LED flashlight. This is a compactly built flashlight with excellent features. It has 5 brightness levels, which give the user different options. The low mode can be used for studying, while the high mode can be utilized to light a path. The flashlight is also easy to use with a tail cap switch and side switch. Its sturdy construction means that you will use this flashlight for a very long while. The PD32 flashlight is powered by one 18650 battery or 2 CR123A batteries. It uses Cree XP-L HL white LED that produces a maximum of 900 Lumens. The beam reaches over 787ft. For such a small and compact light, this is just outstanding and you will never be disappointed. Related: You can also check Top 10 Fenix flashlight review here. Durable construction – the PD32 LED flashlight is strongly built to withstand all the hardships of an outdoor environment. So, if you accidentally crash it, drop it, or immerse it in water, it will still function. Also, the aircraft-grade aluminum body is lightweight and not a burden to carry. Uses CREE XP-L HL white LED with 50, 000 hours lifespan – this is an indestructible LED bulb that will serve the user for many years. It produces white light and the beam reaches over 787 ft. Unlike fluorescent bulbs, this one doesn’t break. 5 brightness levels with SOS and strobe mode – if you intend to use the flashlight for different reasons such as reading, lighting a camp, blinding an enemy or asking for help, you will have to cycle through the different modes. So, you won’t be just using this flashlight for its lighting purpose alone. Although, Fenix have some quality lights which have same type features and powerful lighting like this Fenix pd35. IPX8 waterproof rating – whether you live in a cold or hot area, the PD32 will still perform exceptionally. It has a waterproof rating of IPX8, which implies that you can use this flashlight underwater up to 2 meters for 30 minutes. As well, if you drop this flashlight one meter away from the ground, it will still function very well. Easy to use dual-switch – made with two switches, using this flashlight is fun and easy. Simply switch on the tactical tail switch for monetary on function and then the side switch to cycle through the different modes together with the hidden SOS mode. Over-heat protection – your flashlight will not excessively heat like other lights on the market. This is because it has an over-heat protection that adjusts the light mode from high to low so that the flashlight doesn’t heat too much. Low battery voltage warning – one of the worst experience flashlight user’s encounters is having a flashlight with a battery that is almost running out. This should be avoided at all times. Check the battery level indicator to make sure that your battery is full or almost full before heading out of the house. Limited lifetime manufacturer’s warranty – Fenix is a trusted brand and they provide an excellent warranty to buyers of their products. 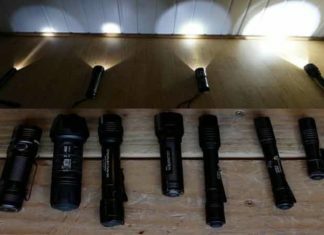 So, you have nothing to worry about when you buy from Fenix flashlights. 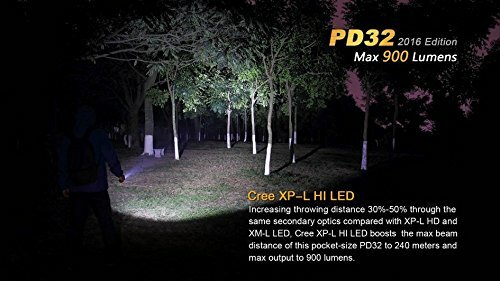 Why choose the Fenix PD32 900 Lumen light? This flashlight from Fenix is sturdily built for multipurpose use. The 5 light modes make it suitable for carrying out different tasks. In addition, it has the SOS and strobe mode. So, it can be utilized by emergency responders as well as law enforcers. It uses an indestructible LED and covers a wide area. Whether it is hitting an assailant or walking the dog, this flashlight will not disappoint. The Fenix TK15 upgrade version is Fenix TK16. The TK15 was only 400 lumens but TK16 is now 1000 lumens. On the other hand Fenix pd32 is 900 lumens. Check below the difference between the Fenix pd32 and tk15. What is the difference between PD32 and PD30? If you want to know the difference between Fenix pd35 and pd32, then read here. If you have been looking for a compact and powerful light for your everyday use, then the search is over. A flashlight can be the difference between you arriving safely where you are going or being attacked on the way. If you don’t have a flashlight, it is difficult to see what is in front of you, or who is hiding in the corner. 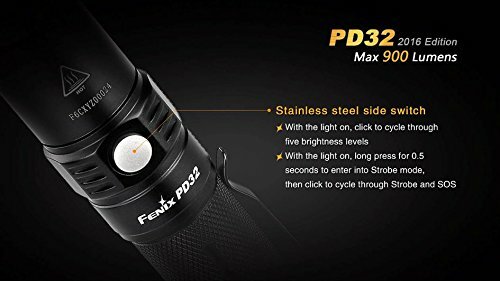 The Fenix PD32 2016 rechargeable flashlight is not only small in size, but it also performs exceptionally well. Keeping this light is not a problem at all and you won’t feel burdened by having it. It can resist water with its IPX8 rating and its impact resistant up to one meter. Use it for your outdoor activities or for general use. Still, have a question after reading this Fenix PD32 review? Comment below.